The summer weather has meant spending as much time as we can outside. As well as day trips, picnics in the park and time at the beach, we are choosing to be out in the garden rather than stuck inside. One of the wonderful benefits of this is the lack of mess. I am not a brilliant housewife as I am sure the bloke will tell you and having less to clean up certainly makes the house look good for longer! Being outside isn't just for playtime though. Dylan's new found love of throwing his dinner into each corner of the room is less stressful when it goes over the fence into next door's garden. Equally his insane splashing that begins the moment his feet touch the water and ends only when he is forcibly removed from the bath covers the ground in a layer of water rather than the bathroom carpet. 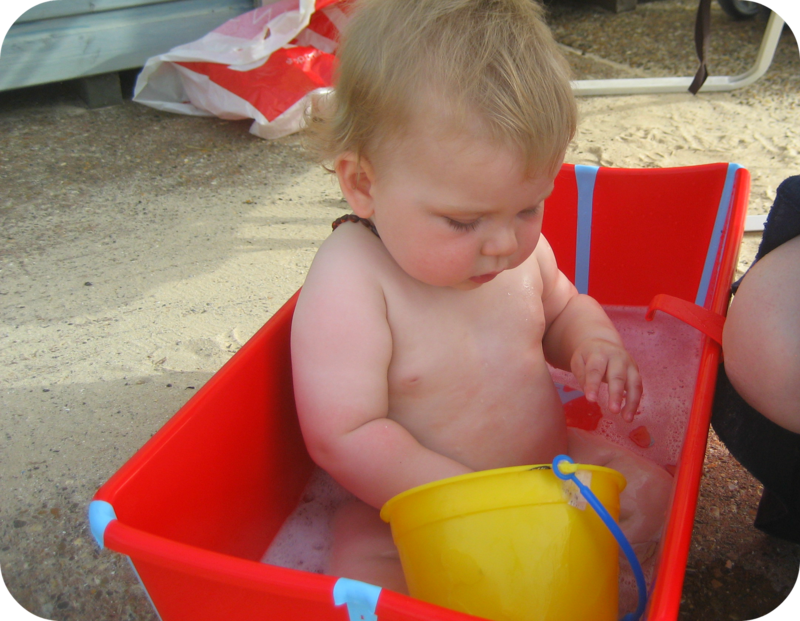 We have been sent the brilliantly practical flexibath to review and it has come into its own in this lovely weather. We have taken it down the beach hut of an evening and enjoyed a nice tea and bath down there before coming back just in time to put the sleepy little dude to bed. We have also used it for splashing in the garden as Dylan is getting a bit big for the washing up bowl now! When the weather hasn't been so great, we have filled the bath with balls to create a mini ball pit and Dylan has loved emptying them one by one. It has also been well utilised as storage for our cloth nappies and is the perfect size to fit them all in! The flexibath is very handy as when not in use, it folds down and is easy to store away. We can slot it away in the bathroom and just put it up when we are ready to splash. There is a plug in the bottom so no need to pick it up to empty it, and it comes in a variety of cool colours like the red and blue we have. 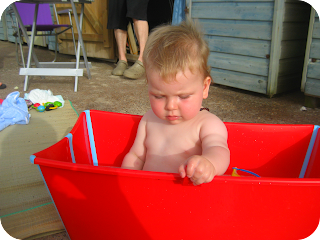 The flexibath states it is suitable for 0-4 years, but I don't think it will last us anywhere near that age. Dylan is an incredibly large 11 month old (27lb / 12kg) and he doesn't have a huge amount of growing space. It also doesn't have the same easy curve of a traditional baby bath which means it would be more difficult to support a little ones head comfortably. 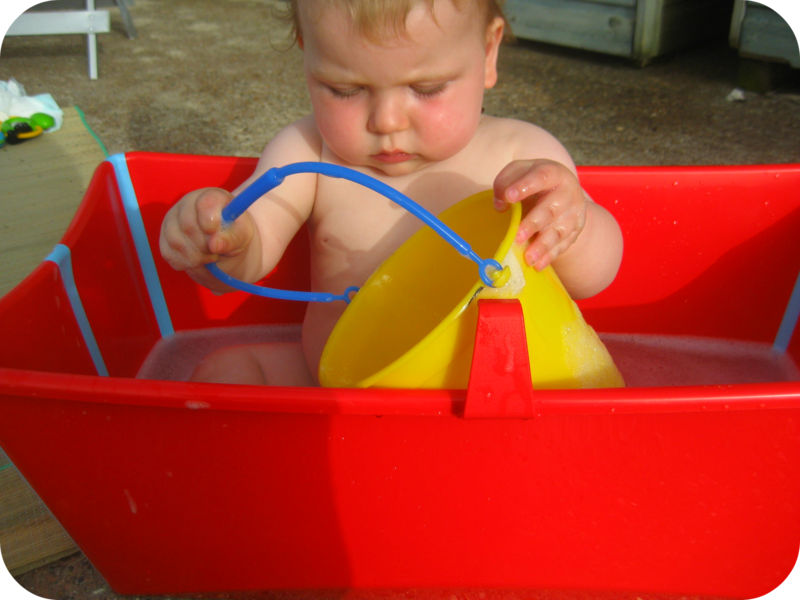 As a travel bath however it is perfect, stowing away easily and perfectly useable for a wide age group. For anyone with a small bathroom who does not have the space to store a great chunky baby bath I would certainly recommend it as well as for anyone who only has access to a shower. 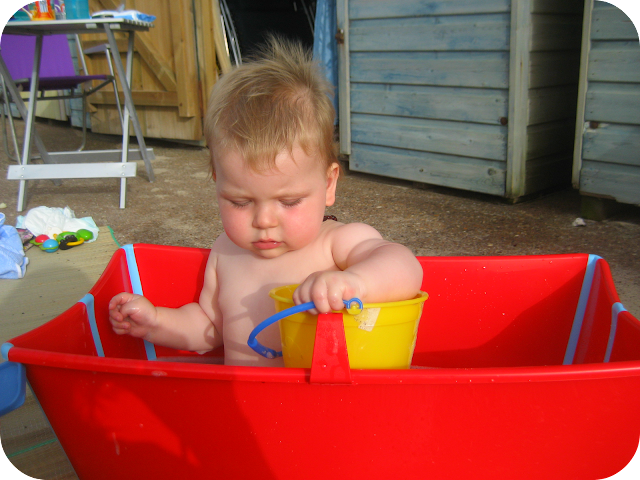 It is also perfect for a playbath and travelbath and even after the little people have outgrown it, it would make brilliant storage as it is strong and durable. With an RRP of £29.95 I think it is well worth it for the flexibility. In only a few weeks we have found so many practical uses for the bath and it has saved my bathroom carpet! It appears to be really well made and looks great and we will be using it a lot over the coming months! I've also got one of these and think it is a great product! Good review, jealous of your proximity to the beach! That does look like a great outdoor bath. I'm not sure I'd ever put a 4 year old in it mind, but then my 22month old is tall for her age too so my perspective might be a bit skewed! He loved playing with the little catch that keeps it all together when folded! It really is a beautiful product isn't it. It is - I love how colourful this one is too - perfect for summer! I bet Riley would love it!